Geotripper: O, Gumby, Where Art Thou? O, Gumby, Where Art Thou? It's been nearly a year since Art Clokey, the creator of Gumby and Pokey, passed away at the age of 88. 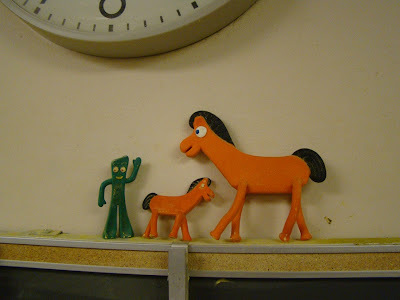 I watched Gumby as a child, although it's been a long time and I don't remember a lot aside from the strange way Gumby skated, and that his friend was the orange horse named Pokey. They helped kids solve moral quandaries. Many people today probably remember Gumby more from the Saturday Night Live sketches in the 1980's with Eddie Murphy. 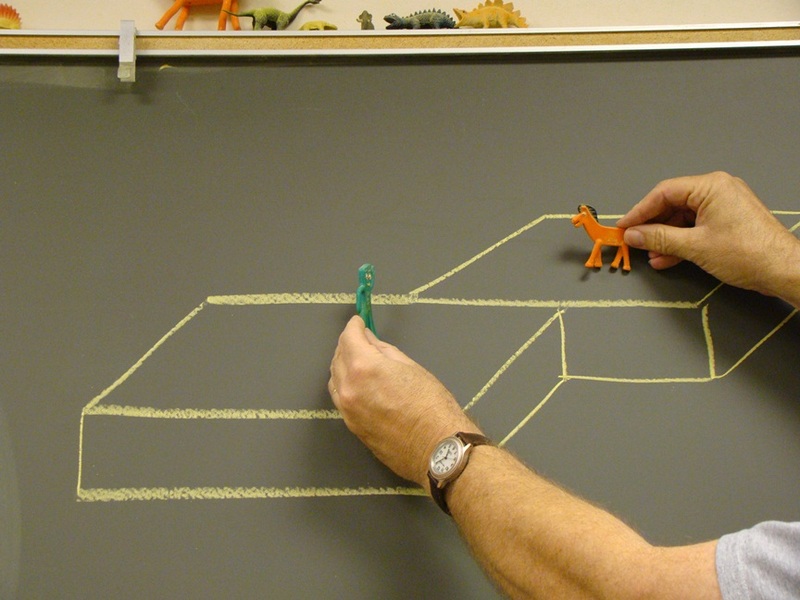 I didn't know a lot about about Art Clokey himself until this year, when I found that he had a profound interest in geology! He attended geology classes at my alma mater, Pomona College, although the second world war prevented him from finishing a degree. He was the adopted son of a professor at Pomona College as well. It is a small world sometimes. My intention was to talk about lighter things, though. These are the characters that grace the top of the chalkboard in my geology laboratory. I use them to illustrate a number of geological principles, including the difference between right and left lateral offsets on a strike-slip fault. Note, for instance, how in the picture below that from Gumby's point of view, Pokey has moved to Gumby's right. Putting yourself in Pokey's place, you can see how Gumby has moved to Pokey's right. This fault moved with right lateral motion. I also describe Gumby in a perilous situation below, where he is about to be squashed in a fault zone (Maybe we need Mr. Bill for this one....). He has to climb out, but he can only step on the fault's footwall. The overhanging block, the one on which he would bump his head, is the headwall. When faults move vertically, they will be defined as normal or reverse based on the relative movement of the headwall relative to the footwall (headwall up is reverse; headwall down is normal). There are mineralogical connections as well. 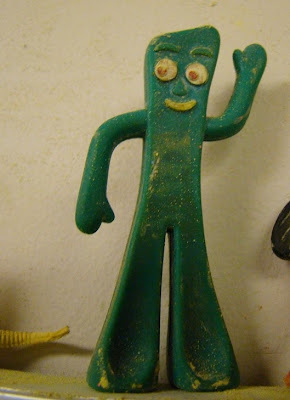 Gumby is a tenacious character sometimes, so helps to demonstrate the mineral property of tenacity, that is the physical reaction a mineral has to stress such as crushing, bending, or breaking. Many minerals are brittle, meaning they snap and break in response to stress without significant bending. Other minerals, like thin sheets of mica, are elastic, meaning they bend under stress, but return to their original shape. Gumby, on the other hand, personifies flexible tenacity. He bends, and stays bent. Minerals like gypsum or chlorite may display this property. There's a mystery this year in the lab. You may have noticed in the second photo that there is a little Gumby and Pokey, and a big Pokey, but no big Gumby. Gumby has disappeared. You would think that in a geology lab that shiny sparkling crystals and fossil samples would be more highly favored items for those with sticky fingers. Who knows what darkness lies in the hearts of humans? There is actually an entire menagerie of prehistoric creatures inhabiting the top of the chalkboard (below). 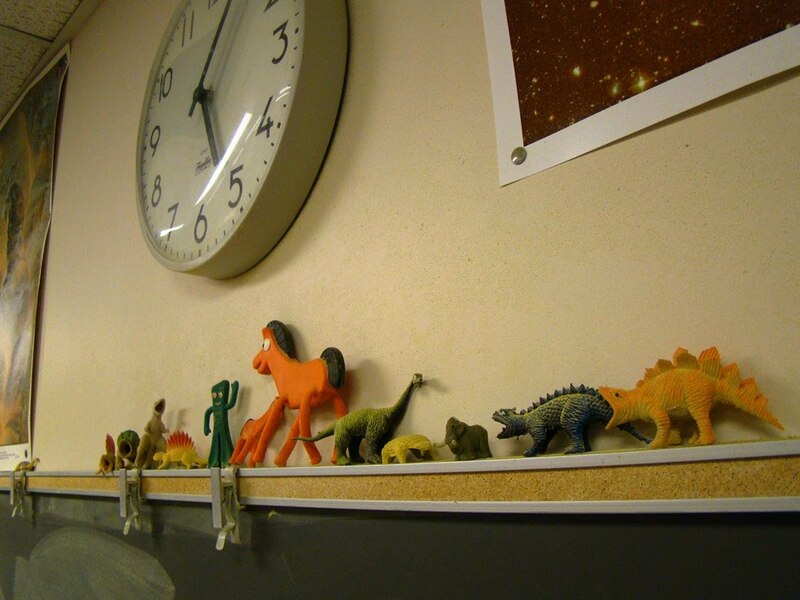 They serve various purposes, mostly to show all the mistakes that toymakers make when they produce toy "dinosaurs". I do actually find myself wondering if there is some sort of "Toy Story" drama taking place up there, and that Gumby has disappeared into a claymation alternate Universe to solve some awful problem somewhere. O, Gumby, where art thou? I hope he comes back. And I hope you forgive a bit of blogging fluff tonight! Maybe Gumby is visiting family for the holidays. We just watched some old Gumby & Pokey movies. It was a flash to the past. I like your prop collection.